The concept is simple: If Google shows you what search results people in your social circle are talking about, those links are likely to be more relevant to you than others. 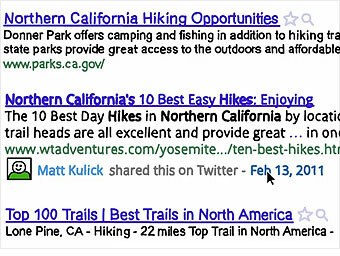 That's why, in February, Google brought its Social Circle product to the forefront of its search results. Comments that people in your social circle have made now appear below individual search results. In practice, however, Social Circle has kicked up some controversy. Google compiles a list of your social connections not just through its own products like Gmail, Google Reader and Google Buzz, but also through third-party applications that make connections publicly available, such as Twitter and FriendFeed. Facebook attempted an ill-fated PR campaign to show that Social Circle is a "sweeping violation of user privacy." The social network claimed that people are largely unaware that their social graph is being mapped by Google.